In November last year I returned to Australia for my best friend’s wedding in Queensland. She and her husband live in a small outback town called St. George. The town of St. George is about six hours inland from Brisbane and the main industries are cotton and wheat. 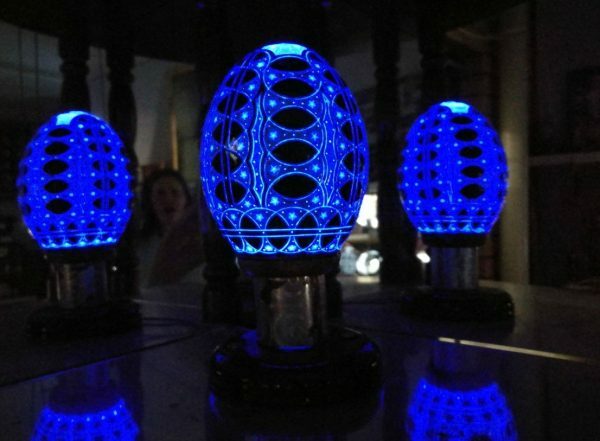 It’s not a place you generally would go looking for tourist attractions but it turns out there is one small, interesting and very unique little museum that is worth visiting; The Unique Egg! On the main street of the town is an unassuming little museum in the back of a hunting supply store. 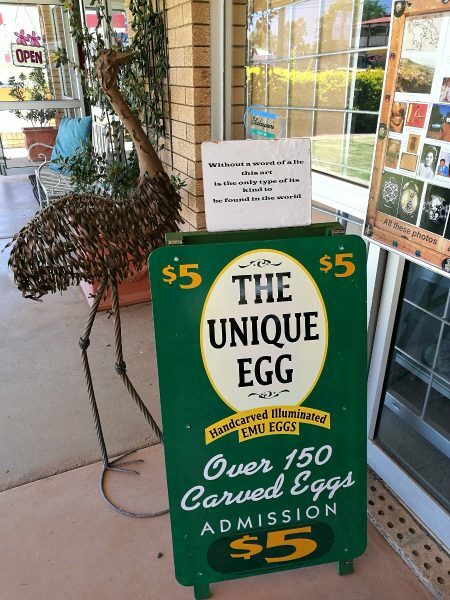 Inside this little store in this little town in the middle of nowhere can be found arguably the largest collection of carved emu eggs anywhere in the world! 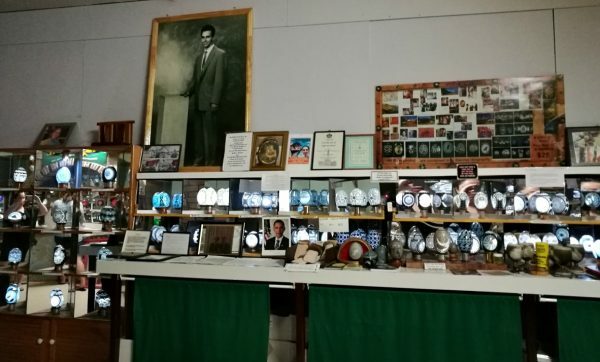 The store, museum and creations on display are owned and created by one man, Stavros (or Steve) Margaritis. 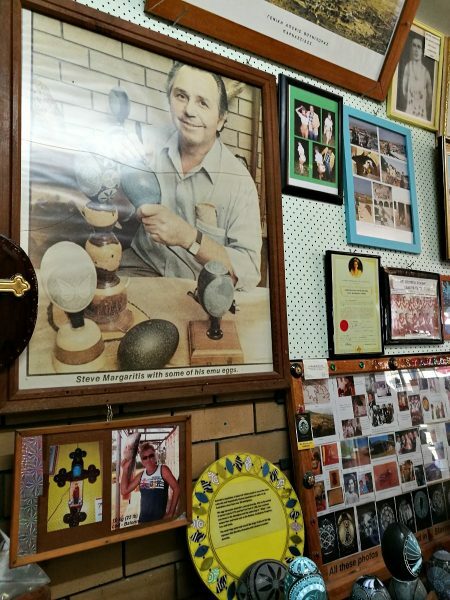 After coming to Australia from Greece after the second world war he was introduced to the art of carving emu eggs, and has now been doing it for nearly six decades. 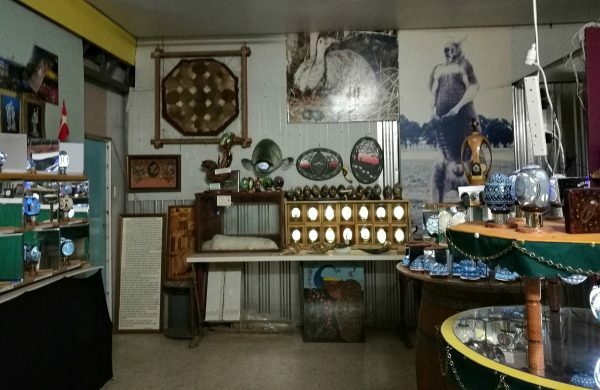 In a room at the back of his hunting supply shop, you can pay 5 Australian dollars to see his amazing collection. 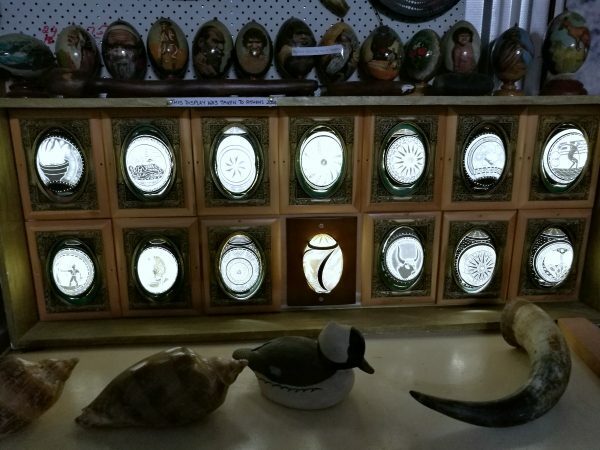 This is not a world-class facility or anything like that, but a little room stuffed to the gills with interesting memorabilia from Stavros’ life in Australia, as well as around 150 hand-carved and illuminated emu eggs. 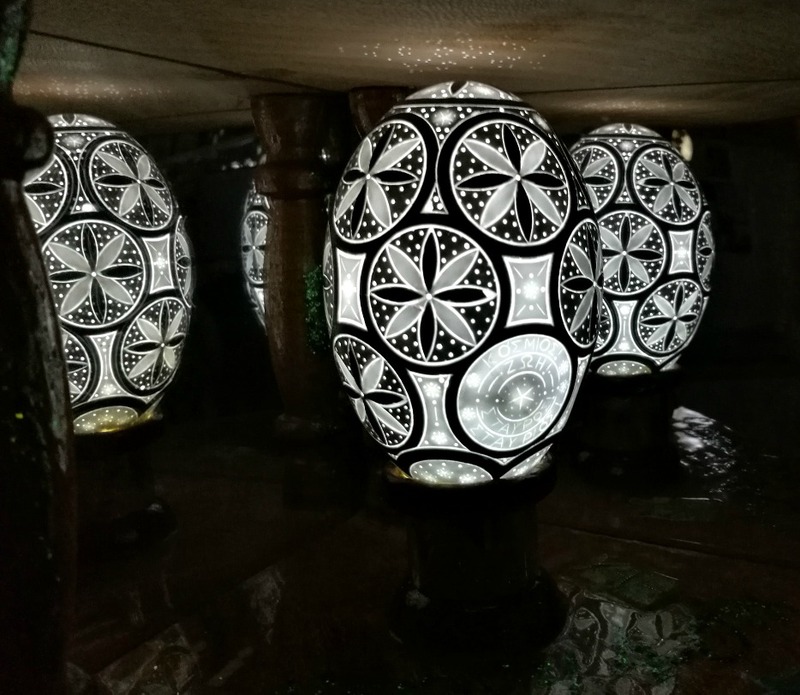 Once you turn off the lights is when you see the real magic! 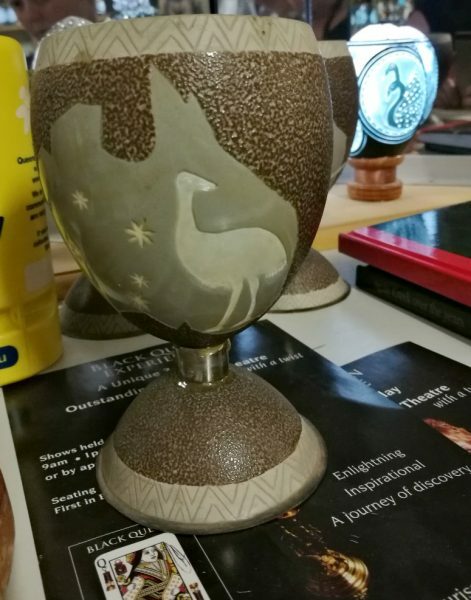 Even though I am an Australian and have lived in three different Australian states I had never really heard of carving emu eggs before I visited the Unique Egg. 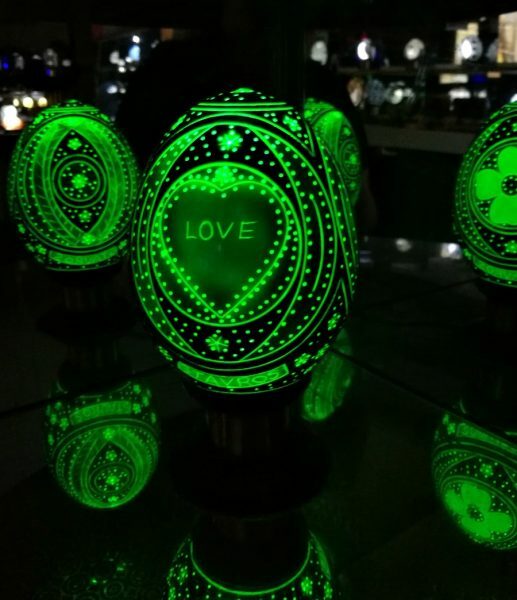 Obviously the size of the eggs makes them good for carving or painting, and apparently the changing colours as you carve through the layers of shell also make them very unique and beautiful. 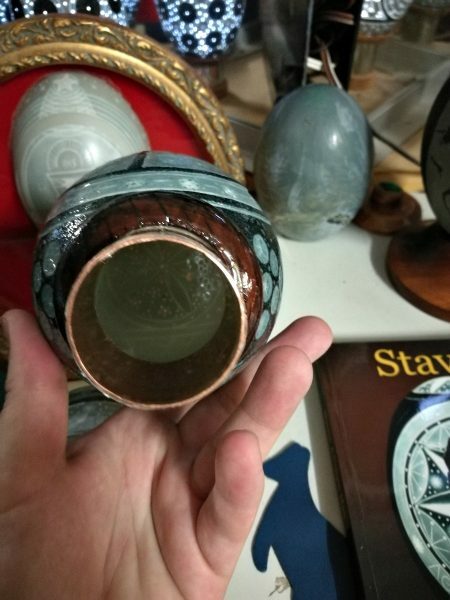 The egg on the left above shows how the colour of the shell changes as it is carved layer by layer. From a dark olive, to lighter greens and even cream it’s fascinating to see the colours found in the shell. 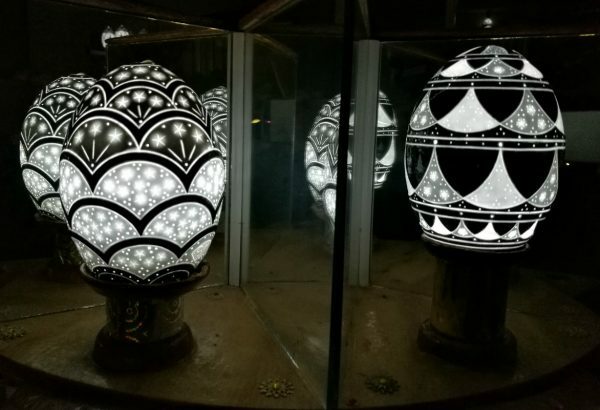 The picture on the right shows how Stavros mounts the hollowed and carved eggs onto light bulbs to create the wonderful illuminated displays. When you arrive and pay your entry fee you also see a short video about Stavros’ life and his egg carving, and he showed us the tools he uses to carve the intricate patterns and pictures into the eggs. What’s especially amazing is he was completely self-taught and just lets his imagination run wild. The designs can sometimes take weeks to complete! 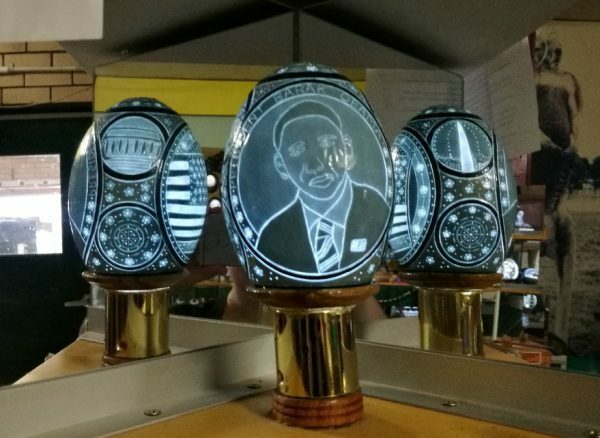 This carved egg collection has been displayed at world expos, and Stavros often carves eggs to commemorate specific events like Olympic Games. 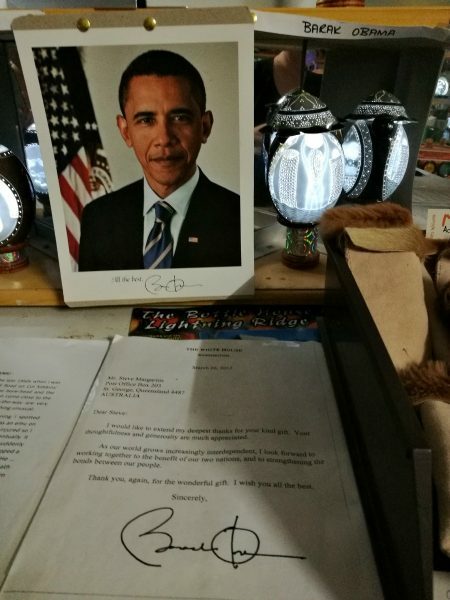 He even sent a carved egg as a gift to Barack Obama while he was president of the United States, and received a letter back! 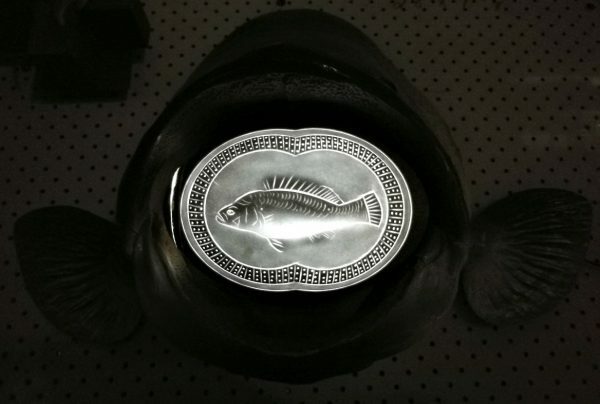 You can also see a replica of the one he sent. 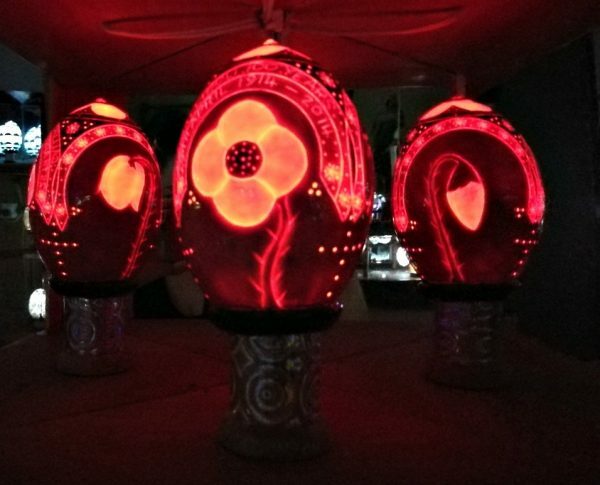 I particularly liked the ones with coloured lights illuminating them, especially the ones that were carved with red poppies to mark the 100th anniversary of WWI. I was initially a bit unsure about the whole idea of carving emu eggs. But there is information on display about emu eggs, and the fact that millions are laid in the wild, and Stavros has his eggs supplied by a local aviary reassured me. Emus are often farmed in Australia as well, so there is no shortage of eggshells for carving, although I certainly wouldn’t recommend anyone trying to steal some eggs from a wild emu! Apparently they are quite expensive, and you cannot buy any of Stavros’ carved eggs. 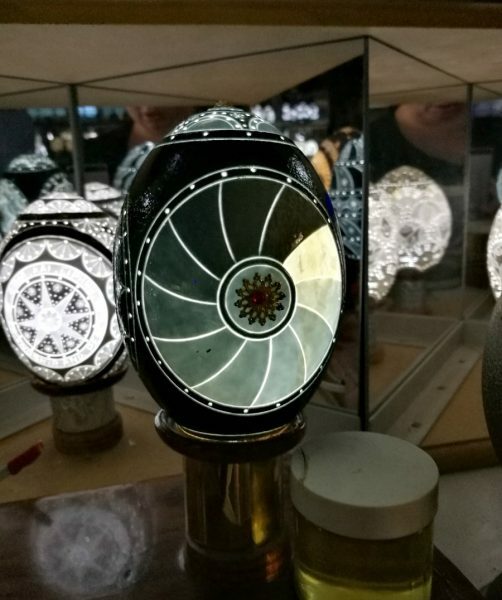 But of course, this way anyone can enjoy seeing them all together, as well as learning about the process and having a look at the other things on display at the Unique Egg such as a goblet made from emu eggs, and lots of information about the artist’s fascinating life. 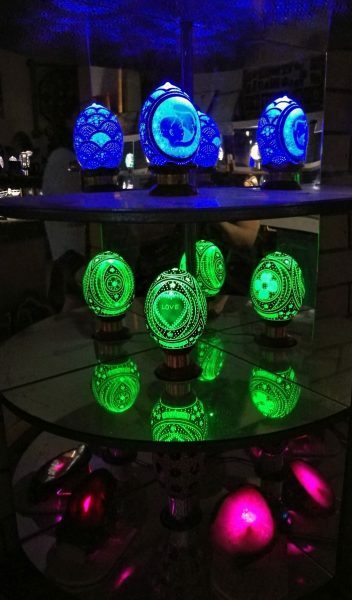 There isn’t a website for the Unique Egg, but there is a Facebook page. 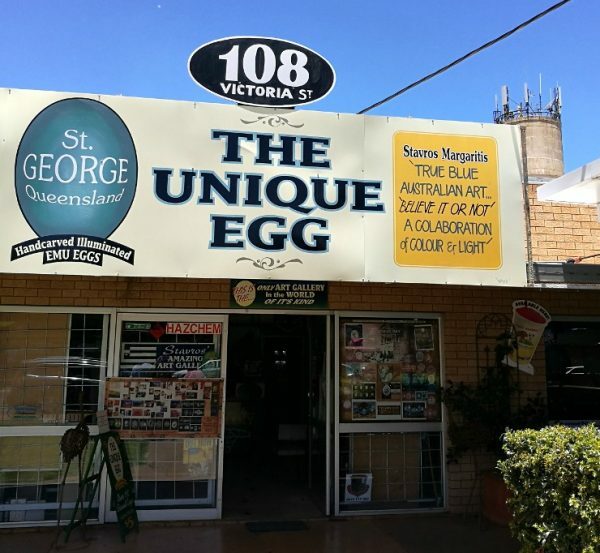 If you’re ever in St. George, Queensland then you should definitely check it out! 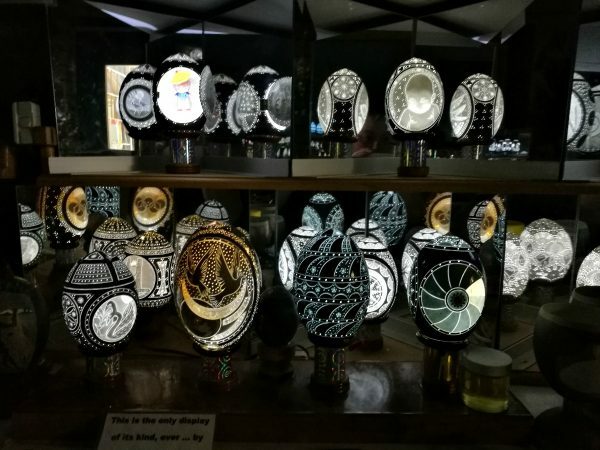 Have you ever been to an unexpectedly unique museum such as this one? Let me know in the comments! 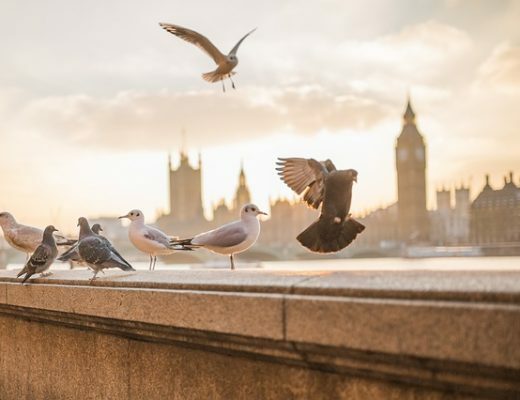 Check out the rest of my Culture Vulture series for more of my favourite museums and art galleries, and don’t forget to save this to Pinterest in case you might one day visit The Unique Egg yourself! 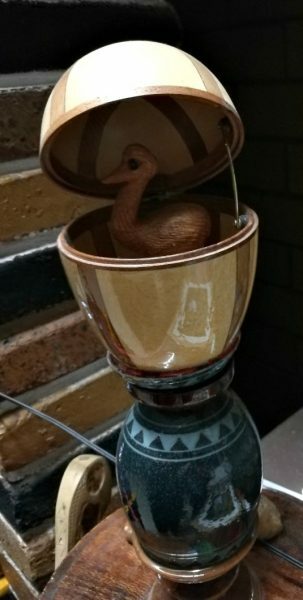 I’ve also never heard of carving emu eggs before! The illuminations look beautiful though and for some reason they totally work! What an interesting story about Stavros and his life. 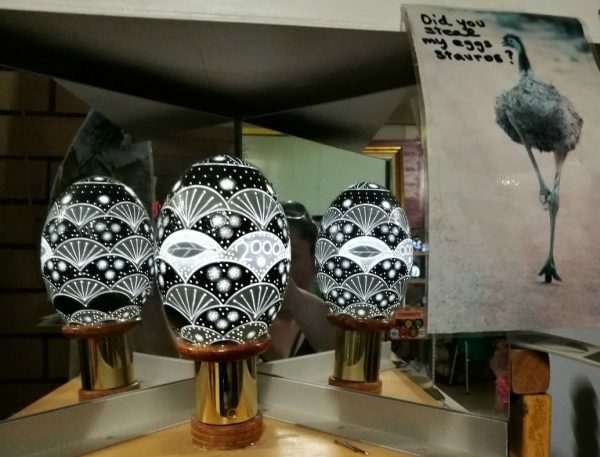 Thanks for sharing his tale with a wider audience and I hope that more people will venture over his way to see the emu eggs for themselves. Me too, it’s definitely worth a visit! 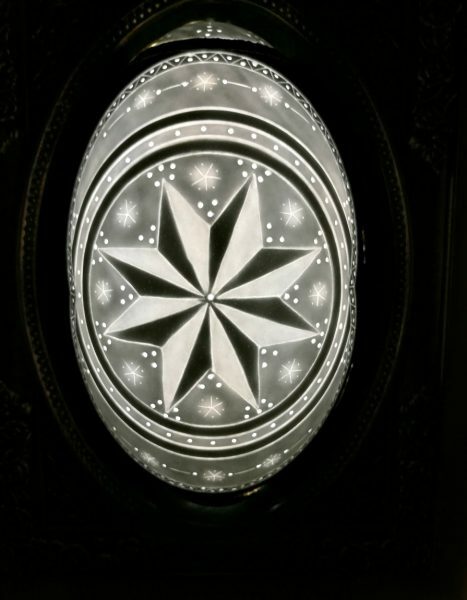 It’s a shame such skillful craft isn’t more prominently showcased! 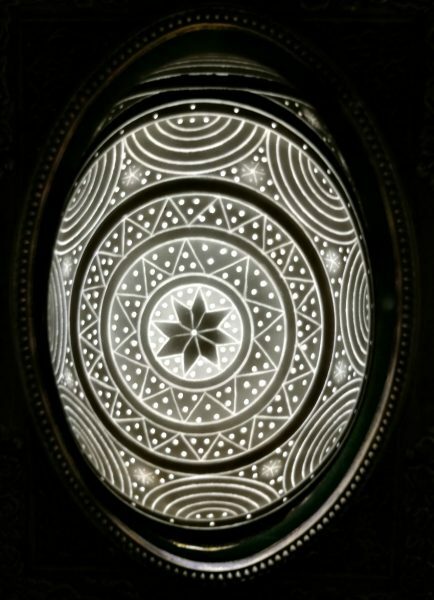 I would love to learn how long it takes him to carve these intricate designs, how he collects the eggs, or even try my hand at carving (breaking?) an egg. Thanks for showcasing this little gem. 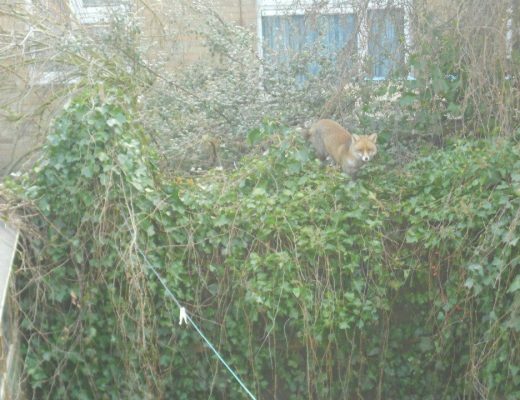 Yeah, it would be great to have a try for yourself, although I’d be worried about wrecking the egg! These are so cool! I’ve never seen anything like this. 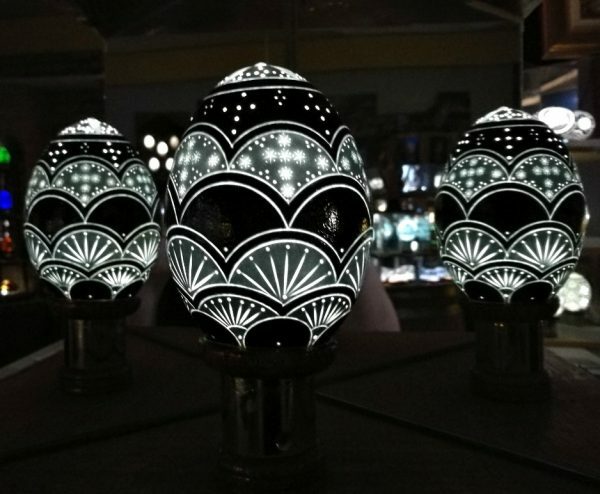 I mean, I’ve seen painted regular sized eggs, but this is crazy cool. I know, right? I’d never seen anything like them before!